I’m asked all of the time, “How do I use demographic information to find the best location for my new business?” This article will also show current business owners, how to find those communities to market to though. All of the information you need is available online and is 100% free. For some reason, most demographic reports pay little to no attention to the disposable income in an area? There are many ways to discover it, and while I won’t detail every way, I’ll show you some quick ways to find it. If you are comparing a bunch of different cities for disposable income just type in the zip codes at city-data.com. Scroll down the page a little to find the Cost of Living Index. The lower the number, the more disposable income, but this number is only to be used when the average household income is very similar. You could also get estimates on electricity, heating, etc. costs and subtract those costs from the income number. Poverty rates are also of great value. All of this is available from both City-Data and Censtats.Census.gov. Later I’ll be overlaying these cities on Google Maps, so that I can locate competitors and non-competitors. I also created a massive article on real estate value fluctuations, which can be found here Real Estate Values. Population, Income, Median Age, Percent Currently Working, etc. All of this information is readily available at City-Data, but we can also use the Government Census data to spot trends. 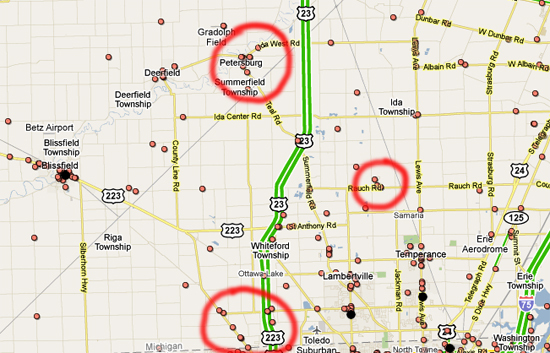 All of these locations are in the same county, Monroe Michigan. If I wanted to find employment trends in Monroe I could just go to this Government Census page. It lists the flucuations in employment from 1969 to 2000. To find more accurate employment data you could go to the Bureau of Labor Statistics. Their they list the up to date unemployment rates in numerous communities nationwide. You’ll also find a ton of information there, on inflation, what consumers are spending money on, industry earnings, etc. Based off of the information above Ida looks great, but if a location existed between Ida and Ottawa Lake, with no competitors; that would be better yet. If you go to Google maps and search for the word store, and a location, you’ll see every store in that area. Why is this important? You want to find a location with current stores, but that doesn’t contain a competitor. Well, there is a competitor already in Blissfield so that really re-enforces the idea to not locate their. There is a big empty area as well in Ida and Ottawa Lake. 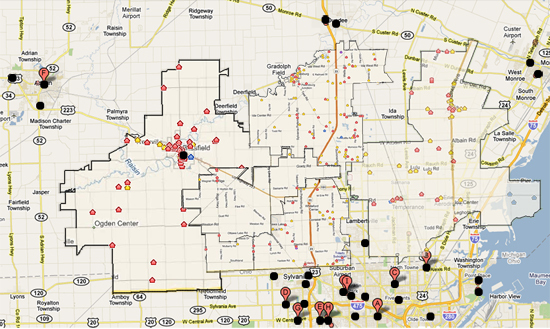 So, now if we can find local high traffic stores to locate next to (like grocery stores) we’ll be set. Here is the map and I circled specific areas that looked good for numerous reasons. The Rauch Rd location looks fabulous because of the proximity to Ida and the stores there, but either of the other locations would probably work great as well. You’d definitely need to be able to buy property there obviously. I would also visit those local business’s and ask if they think your business would be a good fit. That is a brief overview on how I study demographics. If you have any questions leave them in the comment section below. I am trying to get a list of disposable income level by zip code. Do you know of an effecient way to generate this information?